The Kask Star Lady is with his weight of 570 gram one of the lightest helmets on the current market! This Italian made helmet is perfectly finished and with his glamorous Swarovski Crystal rocks a real addition to your outfit. Read the instructions below about how to order the right size Kask helmet. The Kask Star Lady is with his weight of 570 gram one of the lightest helmets on the current market! This Italian made helmet is perfectly finished and with his glamorous Swarovski Crystal rocks a real addition to your outfit. The molded outer shell, in ABS, is very resistant and light. It is covered with a special textile material, which is waterproof, scratch resistant and washable. Additionally, the soft eco-leather chinstrap is hypoallergenic, washable, and helps avoiding irritations of the skin. It adds a touch of style to this model, which will be much appreciated by the most demanding riders for its fit and design. The comfortable and breathable inner padding is made of 100% Merino Wool: a natural antibacterial fiber that provides unique levels of breathability and thermoregulation. The inner shell is made with expanded polystyrene and features three levels of densities in order to ensure total shock protection, comfort and lightness. Put your Kask helmet and liner in your shopping cart, a Kask liner is free if you purchase it together with a Kask Helmet (maximum of one liner per Kask helmet).The discount wil be calculated in your shopping cart. 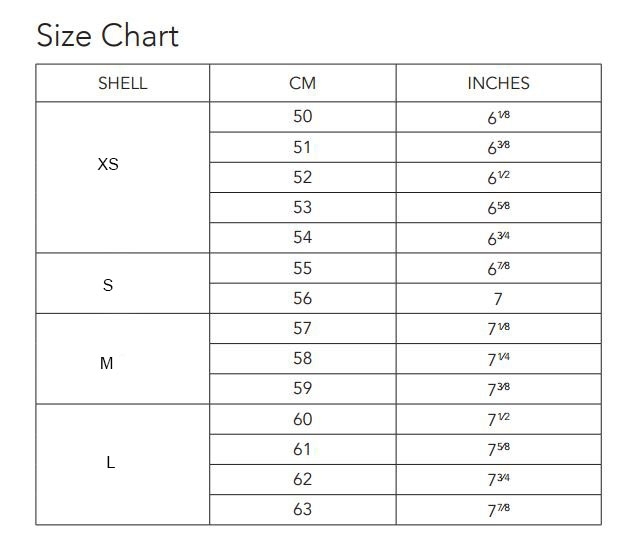 There are 4 different shell sizes to create the perfect head/helmet ratio.